Some might say Terry Wahls, M.D., is a walking miracle. She’s also an extraordinary example of an individual who applied medical and scientific knowledge and tireless determination to tackle a life-threatening situation. On Thursday, Dec. 6, she will give the keynote presentation at the DMU Research Symposium on campus. 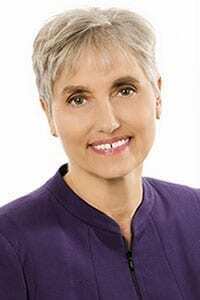 Dr. Wahls is a clinical professor of medicine at the University of Iowa Carver College of Medicine and a clinical researcher with more than 60 peer-reviewed scientific abstracts, posters and papers. But she’s also a patient with progressive multiple sclerosis. This autoimmune disease damages the brain and spinal cord and is the most common cause of early disability in the United States. First diagnosed in 2000, she valiantly sought out the best doctors, received what she calls “the best care possible in the opinion of conventional medicine” and took powerful (and highly expensive) drugs. She switched to a caveman-style paleo diet after being a vegetarian for almost 20 years. Nevertheless, her condition declined to the point she had to quit most physical activities and resorted to a tilt recline wheelchair. That’s when Dr. Wahls’ academic medical training went into warp drive. She dug into research on multiple sclerosis and drugs in trial that might counter the disease. Since those drugs were years away from governmental approval, she developed a long list of vitamins and supplements that benefitted the brain. She tracked those substances to foods that contain them and then shaped her diet around those foods. She also tried neuromuscular electrical stimulation, or e-stim, that “hurt a lot” but made her feel euphoric when the session was over. Since then, she developed the Wahls Protocol™, an integrative approach to healing chronic auto-immune conditions. She’s written two books and a cookbook about the approach. She changed how she practiced medicine and secured funding to test her interventions on others with progressive multiple sclerosis. She gave a TEDx talk about her experience, “Minding Your Mitochondria,” which has received more than 1.5 million views online. At the DMU Research Symposium, Dr. Wahls will discuss dietary approaches to treating multiple sclerosis-related fatigue. She’ll review diets that have achieved favorable clinical outcomes regarding an autoimmune condition. She’ll also recommend a simple test that patients and clinicians may use to monitor the health of the microbiome, the microbes that live in our bowels.